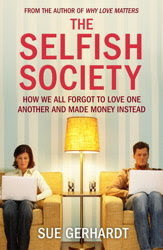 I've recently finished reading The Selfish Society: How We All Forgot to Love One Another And Made Money Instead, by Sue Gerhardt. The prime focus of her analysis is on the negative impact of current parenting styles - how the development of capitalism led to the cultural reinforcement of child-rearing practices that perpetuate a money-grabbing, 'me' culture, where we fail to acknowledge the benefit of good relationships. Drawing on psychology, neuroscience and history it's a grand, wide-ranging tour through our psychic landscape. A few pages at the start of chapter 4 struck me more than any other. Describing the rise of the 'social brain' in Europe, Gerhardt references 'the civilising process' described by historian Norbert Elias as leading to an increase in self-awareness during the middle ages - the thesis is that "the medieval brain was in some respects like that of a very young child who lives for the moment and who has not yet developed great self-control", and that the move away from a feudal system towards a world that required more complex social relationships had an impact on people's brains and awareness levels. "As societies became more focused and organised," says Gerhardt, "so too did individual brains." She doesn't use the word, but it sounds very much like Gerhardt - a meditation practitioner - is highlighting developments in mindfulness. She calls it "a gradual pooling of increased awareness", while she cites the historian Robin Briggs who described the process as 'a profound shift in conscisouness'. Gerhardt also says all personal and social development is linked to 'the capacity to pay attention', which is of course, a common definition of mindfulness. I don't remember enough of my history studies to comment on how plausible the theories are, but I find it fascinating to imagine how Renaissance and enlightenment thinking, the rise in literacy and the industrial revolution might all have been sparked by a shift to greater mindfulness - that all of these developments were a product of Europeans beginning to relate to their minds in a different way. It is also perhaps interesting to speculate what further developments might ensue from a similar shift in consciousness now. Perhaps this time around we can make an evolutionary shift more consciously, using mindfulness and other practices to deliberately exercise the 'social brain', training ourselves to an ever more enlightened existence. The Dalai Lama has joked that while westerners have made greater strides in exploring 'outer space', Tibetan buddhist practitioners, with the use of sophisticated mind training tools, have been way ahead in the exploration of 'inner space'. Perhaps now is the time when these two expressions of human creativity can be allied together for greater good.